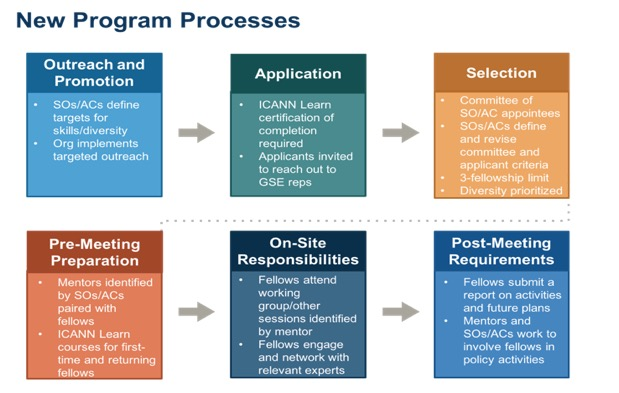 In my last blog about the ICANN Fellowship Program, I wrote about the impending community consultation to review and revise the program to reflect the needs of the community. That process is now complete and we have a proposed way forward. The program's goal is to strengthen the diversity of the multistakeholder model by creating a broader base of knowledgeable constituents from underserved and underrepresented communities around the world. Over the past few months, we have taken a closer look at existing processes to ensure the goals and purpose reflect current and anticipated future community needs. The community has also asked that we implement mechanisms to help collect the necessary data in order to better measure and evaluate program activities. Understanding the return on investment is key to these efforts. Changes will go into effect beginning with the ICANN65 application cycle which opens in November 2018. We began with a consultation to assess the community's perceptions on several aspects of the program, including purpose, goals, size, and fellows' engagement. We then summarized the input which informed the proposal that went out for public comment. The staff report [PDF, 210 KB] on the public comments was released on 10 August 2018. A comprehensive community input status report can be found here. The community offered valuable insight and recommendations. Overall, there is a call for increased Supporting Organizations (SOs)/Advisory Committees (ACs) involvement selecting and mentoring fellows, more data collection to measure the program's impact, and an enhanced focus on active policy engagement. 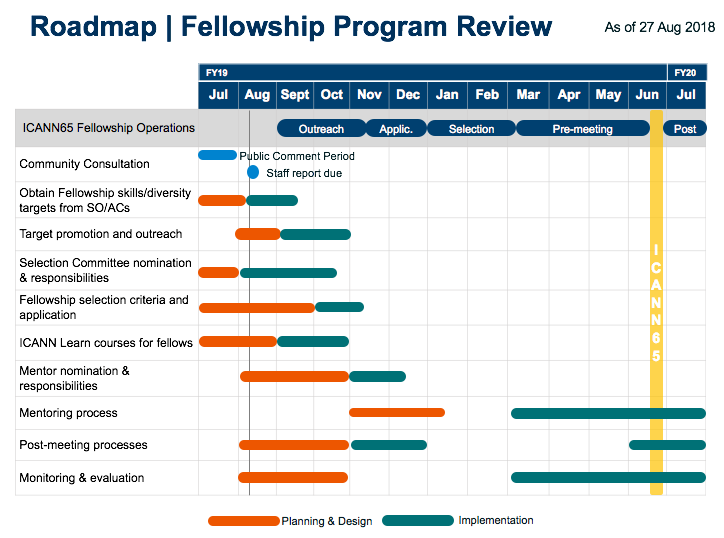 Future fellowship cohorts will consist of 45 participants per ICANN meeting, a 25% reduction from years past. Of the 45 slots, seven (7) will go to Fellowship mentors. We will uphold and enforce the rule which states an individual can only serve as a fellow a total of three instances. Fellows will self-report in their applications on the metrics desired by the community. Returning fellows will be required to provide proof of engagement, with links and attachments where possible (and explanations where not feasible due to the nature of information). Diversity metrics will follow the categories of diversity suggested by the WS2 diversity subgroup. SOs/ACs will have increased involvement in the program by defining targets for desired skills, appointing Selection Committee members, and identifying mentors. SOs/ACs will each nominate one mentor, who will serve for one year; mentors will be empowered to suggest specific SO/AC tasks and work collaboratively to maximize the time and opportunity to actively contribute. Mentors will be evaluated in a uniform process. 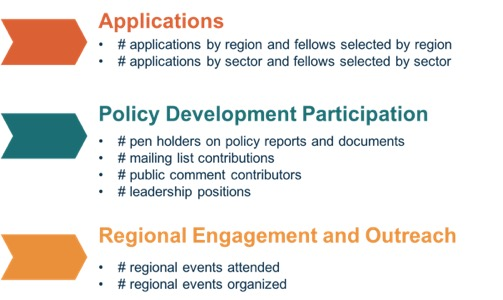 We have updated the Selection Committee Criteria and issued an announcement calling for SO/AC nominees and diversity goals; the goals will be used to inform the outreach and promotion for the Fellowship Program carried out by ICANN org. We have also revised the selection criteria to reflect the input to date. The new Selection Committee will have the opportunity to review the new selection criteria before they are made public. We will require ICANN Learn courses at the application stage to ensure fellows are better prepared. Concurrently, we are enhancing the existing pre-meeting ICANN Learn courses to improve fellows' knowledge of ICANN. In addition, we will pilot the ICANN Fellowship Program Post-Meeting Report starting with ICANN63; this report will be produced by fellows and shared broadly with the community for increased transparency. We are grateful for the support and guidance to date and look forward to working closely with the community and continuing to improve the ICANN Fellowship Program. I would kindly like to know how the 7 slots for Selection committee members and Fellowship mentors are distributed across the community. Thank you for the question. Each SO/AC shall nominate up to one individual to serve on the Selection Committee. The same process applies for the mentors. SOs/ACs will nominate one individual each.